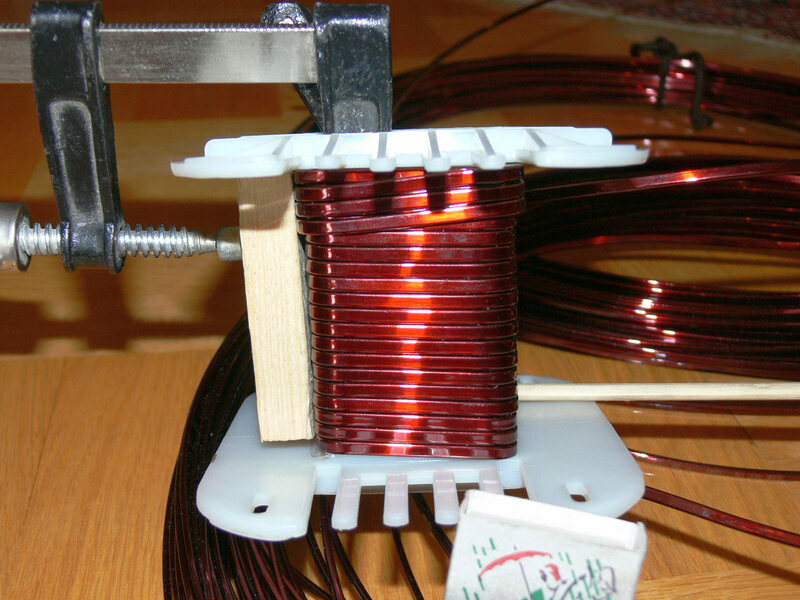 Why do I need a KING-SIZE coil in my woofer crossover? 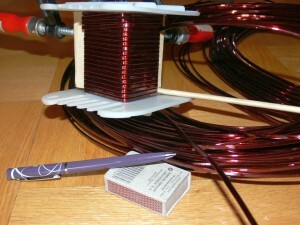 Why use 3 to 4 kilograms of sheer copper per single coil? Why not “Go with the Flow”? Why not use an iron core and be “done” with it? Simple and easy? As mentioned earlier, I am not fully satisfied with the core based woofer coil, the 5,2 mH and 0,2 ohms that I currently have installed in my DIY speakers. Now, I don’t know about you guys, but I do NOT like hysteresis, as it distorts my audio signal. Some shall say, that within the bass frequencies it does not mean a thing, as you “** Can’t hear it **”. Well guess what: What if I told you that that is an “Accountants” version of cost optimization ? 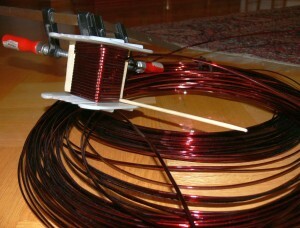 The deal is as follows: it is fairly easy to make an air coil, i.e. a coil that has AIR as the CORE (meaning: none, null, nichts, nothing, zap, zero, …. 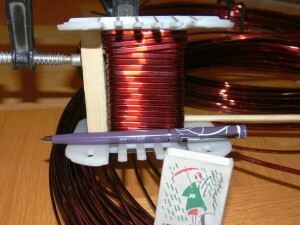 ), provided that you produce it based on THIN WIRE. An air coil, with an “air core”, is very **specific** in the sense that it’s relative permeability is fairly low, mainly: M_r = 1,003 or something. The 1,0000 is reserved for absolute vacuum, and air is slightly “higher” than vacuum, so they say. Whatever. But the permeability of air has one positive side to it: it does not introduce any memory effect. It does not introduce any hysteresis. Well, …. yes. It is a big deal. So, what is the first, most obvious accountant’s solution to the cost / benefit problem ? a). 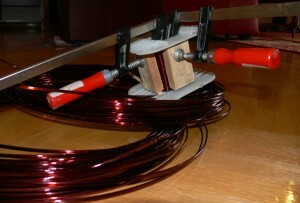 Reduce the diameter of the wire used. This way, the coil will be less bulky. The required number of turns will fit on a smaller carcass. 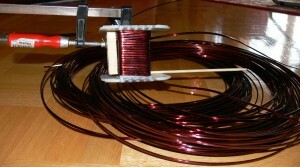 The overall weight of the coil will be smaller, so the cost of the material will also be smaller. But what about the fact that a smaller cross section of wire imposes a much higher overall DC resistance? Well, …. let the audiophiles worry about that one. This “reduce the cross-section” method is most obviously used in the “smaller coils”, those that are typical of the midrange and tweeter crossover circuits. The circuits where any distortion would be more than obvious and Uncle Scrooge would not get away with it. b). Apply an iron core of high magnetic permeability, so as to reduce the necessary number of turns within the winding, so as to achieve the same “inductance”. 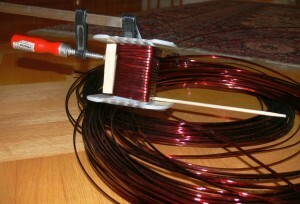 You get “the same result”, but use up much less wire. In other words: keep the audiophiles semi-happy. 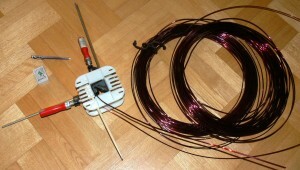 Since the length of required wire is now much shorter, give them what they like best. Give them a “sniff” of some thicker cross section of wire – just to keep them semi happy in terms of a fairly low DC resistance, a parameter which seems to bother them most when considering the woofer crossover circuits. Albeit, this “put in some core” strategy comes at a price. To be perfectly clear: a price to be payed by the audiophiles, and not by Uncle Scrooge. The price is called Hysteresis. As a general rule of thumb, high values of magnetic permeability, which are possible to achieve with iron or ferrite based core materials, tend to introduce “hysteresis”, or magnetic “memory” and hence, they tend to distort the sound. 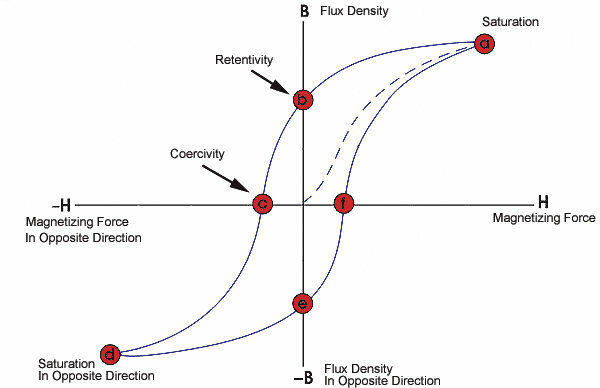 Hysteresis is the dependence of a system not only on its current environment but also on its past environment. This dependence arises because the system can be in more than one internal state. To predict its future development, either its internal state or its history must be known. If a given input alternately increases and decreases, the output tends to form a loop as in the figure. However, loops may also occur because of a dynamic lag between input and output. Often, this effect is also referred to as hysteresis, or rate-dependent hysteresis. However, this effect disappears as the input changes more slowly. Hysteresis occurs in ferromagnetic materials and ferroelectric materials, as well as in the deformation of some materials (such as rubber bands and shape-memory alloys) in response to a varying force. 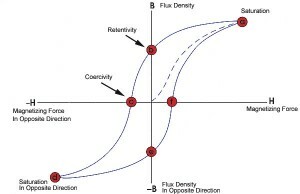 In natural systems hysteresis is often associated with irreversible thermodynamic change. Many artificial systems are designed to have hysteresis: for example, in thermostats and Schmitt triggers, hysteresis is used to avoid unwanted rapid switching. Hysteresis has been identified in many other fields, including economics and biology. Theoretical model of magnetization m against magnetic field h.
Starting at the origin, the upward curve is the initial magnetization curve. The downward curve after saturation, along with the lower return curve, form the main loop. The intercepts hc and mrs are the coercivity and saturation remanence. The relationship between field strength H and magnetization M is not linear in such materials. 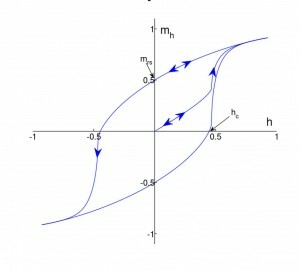 If a magnet is demagnetized (H=M=0) and the relationship between H and M is plotted for increasing levels of field strength, M follows the initial magnetization curve. This curve increases rapidly at first and then approaches an asymptote called magnetic saturation. 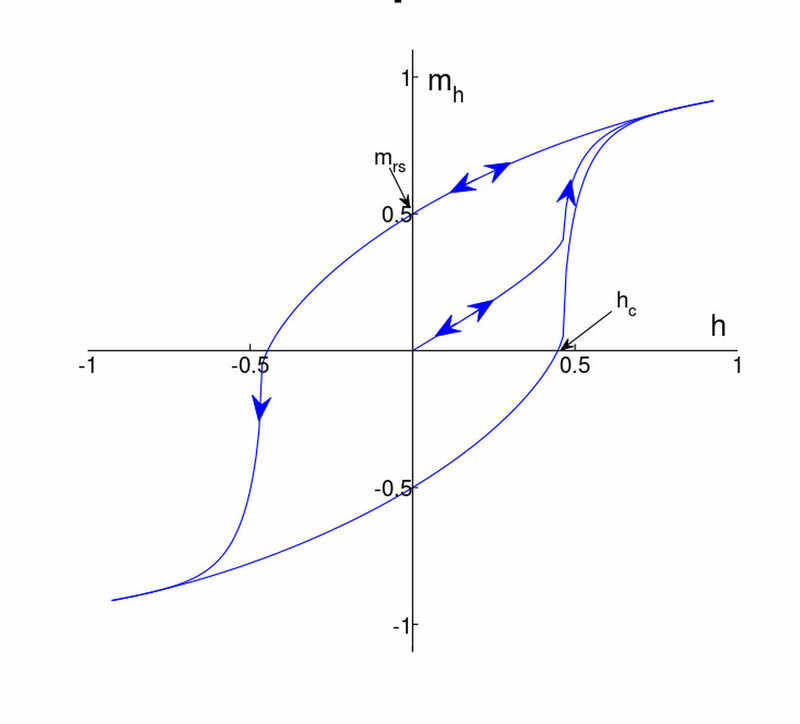 If the magnetic field is now reduced monotonically, M follows a different curve. At zero field strength, the magnetization is offset from the origin by an amount called the remanence. If the H-M relationship is plotted for all strengths of applied magnetic field, the result is a hysteresis loop called the main loop. The width of the middle section is twice the coercivity of the material. ..” (end of Wikipedia citation). As can be seen, this graph above is definitely NOT a straight line. Actually, it is not even a curve. It is an ugly piece of non-linear stuff with internal memory of past signals, past magnetizations, past events. Very ugly. So, now you ask me: what can we do about it ? 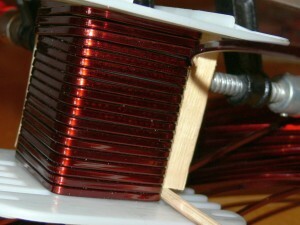 Simple answer: GET RID of the MAGNETIC CORE. Build an AIR COIL. OK, no big deal within the midrange and the tweeter sections …. But how do you obtain a Coil, say, 5,2 mH, of 0,2 ohms for a woofer? Will it cost a fortune? If you even find a place to “source” it, indeed, it may cost a small fortune. So, my simple answer to you is: you BUILD it by yourself. But not 0,2 ohms …. 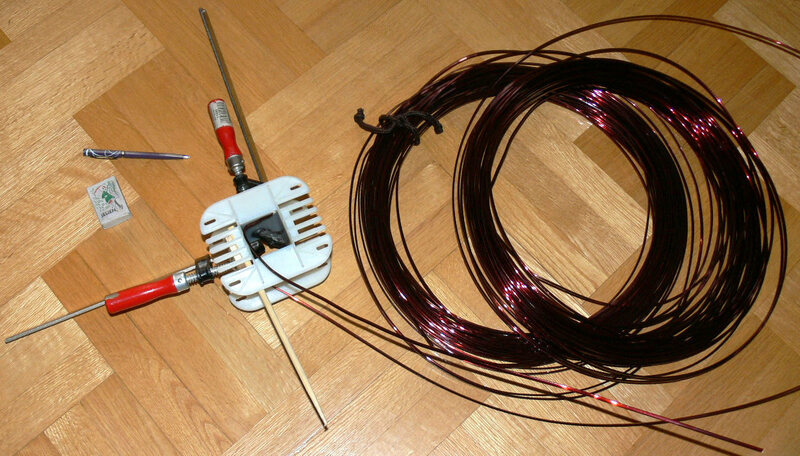 I am targetting for 0,09 ohms. 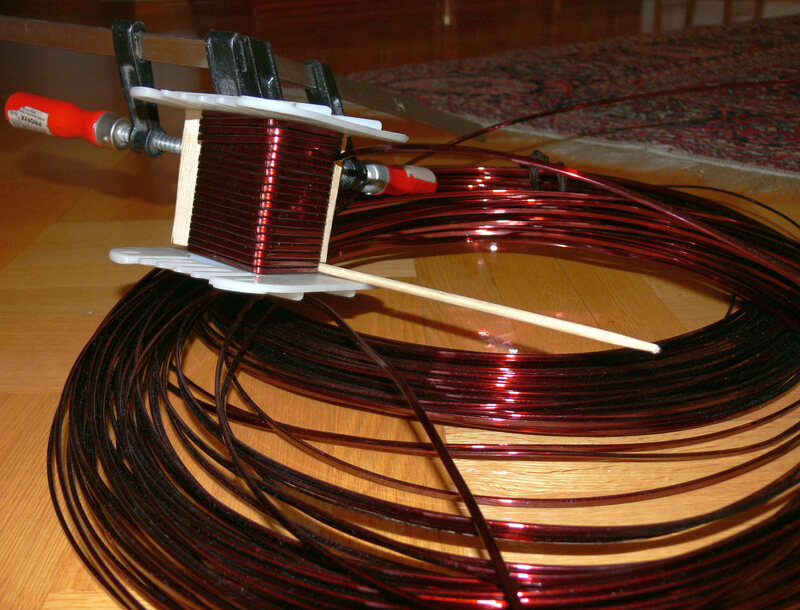 So, what we do now is as follows: We purchase 6 or 8 kilograms of copper winding wire. The exact amount should be calculated with the help of the web calculators, as below. Add some “spare” length to the result, as the accuracy of the result is a function of the accuracy how you shall execute this small DIY project. Actually, the wire that I purchased is not even a wire, because wires have a round cross section. The stuff that I obtained is more of a flat profile, with a rectangular cross section. It is 2mm heigh and 3,5 mm in width, totalling 7 mm2 of cross section area. 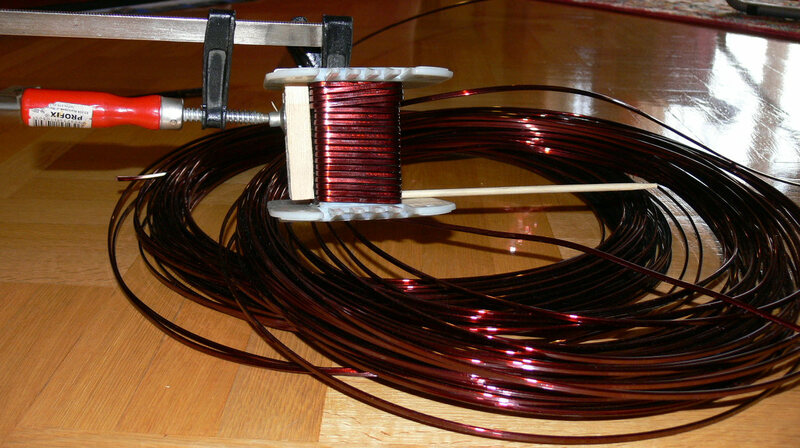 With this “wire”, or profile, I am in the process of creating AIR COILS with an inductance of 5,2 mH and 0,09 ohms. The trouble is that such a profile is very stiff …. so I have supplemented myself with the help of additional tools, such as presses, those used by carpenters. 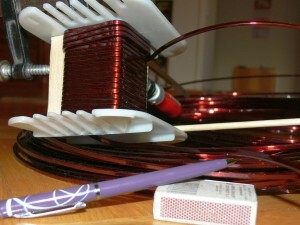 This is what the Work-In-Progress production of my first coil looks like: …. The FIRST layer winding, the first turns, are the most difficult ones to execute, as you have to make sharp bends on the carcass, almost at straight angles, and these bends need to be applied very neatly and evenly. Considering the stiffness of the winding profile, I am happy with the results achieved thus far. I am just starting the second layer, so now the bends shall not be as sharp and generally it should be much easier to proceed now. The tricky thing is to “start” the whole operation. After a few frustrating failed attempts, I came up with a very non obvious, albeit very successful strategy. As the “profile” does not easily bend “sideways” – I gave up the concept of trying to “route it in” via the normal “slots” on the side of the carcass. Instead, I drilled a hole in the floor of the carcass, close to one of the corners – a logical place for the winding to start. I routed the profile through this corner hole in the bottom surface of the carcass (the bottom that would normally “touch” the central iron core of a transformer – albeit: we have no such core – just a hole full of air in the center section of the carcass). After threading an ample amount of starting length through the floor, I bent the profile to a U_TURN shape, but along the thinner axis, i.e. along the 2mm thickness thereof, a direction by which it is much easier to bend. This U_TURN type of hinge creates a pirates hook that firmly holds to the floor and gives you a good starting point of reference for the winding process. 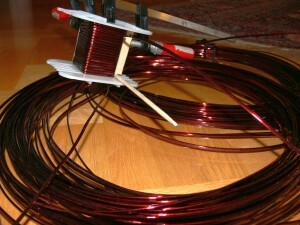 My coil should not weigh more than 3 or 4 kg a piece, when finished. It comes at something like 10 EUR per kilogram, give or take, depending on the thickness of the profile. 2014-02-21: So far, so good. I’m up at layer number 10, with 20 turns within a layer. That is somewhere in the whereabouts of 200 turns. The coil is a beefy 2 kg in weight, give or take. Thanks to the “flat” surface of the profile, it is actually fairly easy to maintain a “flat” surface of the whole winding, even at layer number 10. 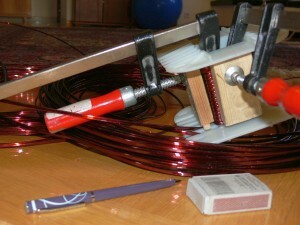 The winding process takes place at a a quarter-turn steps. Each step involves the “unclutching” of the back carpenters clutch, and “re-clutching” it in front of it’s peer – each time a new quarter turn is executed and performed. Under the steel jaw of the clutch I put a piece of wood, so as not to injure the fragile isolation varnish that is on the copper profile. In essence, what I am saying here is that I have already performed 4×200 = 800 cycles of clutching and un-clutching, each time using a piece of wood as a separator. But the effort is well worth it, because the 10th layer is hence almost as smooth and even as the very first one. 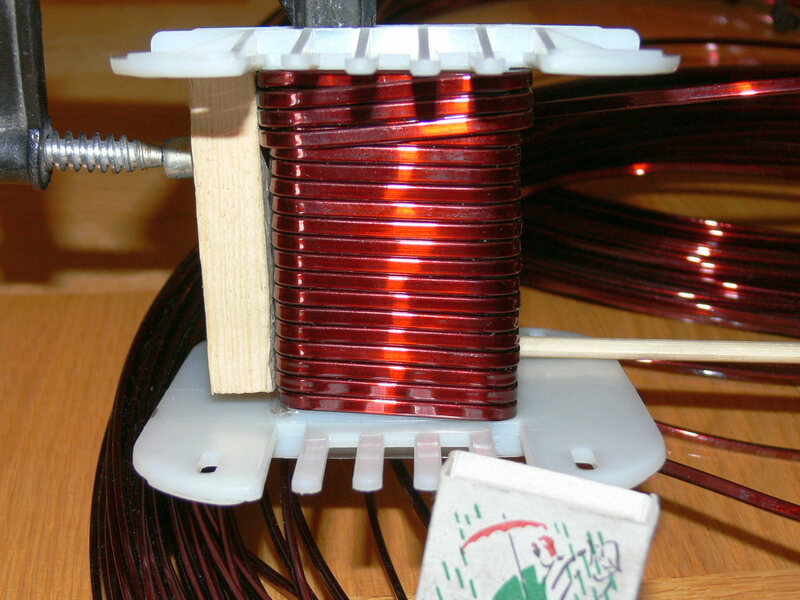 But what about the inductance ? Well, the inductance meter reading states, that I am at a level of 1,5 mili-Henries. But having said that, one needs to keep in mind that two small metal jaws of the two metal clutches protrude into the inside cavity of the winding, so this value of inductance reading may be a bit over-optimistic, say 10%. As for the DC resistance, it goes without saying, for the time being the readings state that it is unmeasurable.